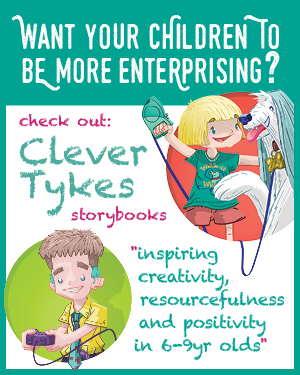 Our latest gift from the Parragon Books children’s range was yet another winner. 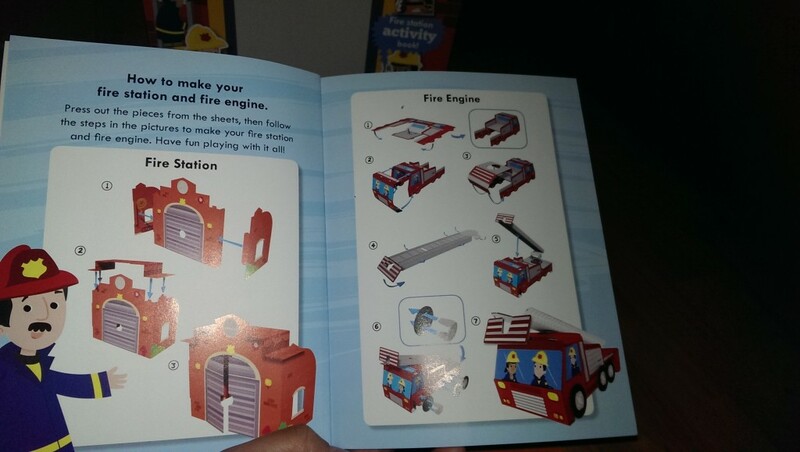 Although it didn’t elicit quite so much excitement as the Fire Station Activity Book, I knew in advance Mushroom would love it as it brings together two of his favourite things – old-fashioned fairy tales (those I’ve been reading to him since he before he was born) and creative activities. 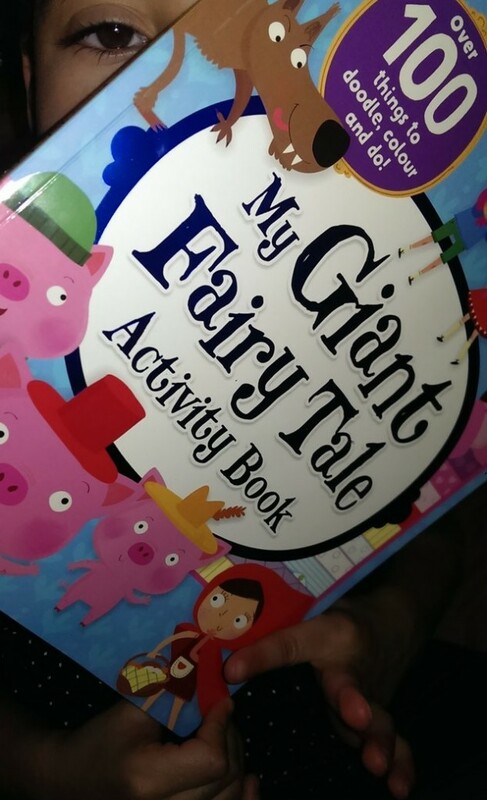 This ‘Giant Fairy Tale Activity Book’ has a good mixture of directed activities and more creative options, which Mushroom loved. I’m no expert but am pretty sure the 100+ activities in the book support the EYFS framework, so it’s great educational fun for rainy days… We have had a few of these since we received the book and we’ve not yet finished it so it’s definitely worth £9.99 – Less than a tenner for a ton of fun. The book is retailing at £9.99 at Amazon but at the time of writing it’s available for just £4.82 at The Book Depository – so go grab yours now! Disclosure: Mushroom and I are Parragon Book Buddies and receive a new book to read and review each month. All views are our own. Read my full PR and disclosure policy here. Our December offering from Parragon Books arrived just before Christmas but as it was a busy time, I popped it in the back of my wardrobe and promptly forgot about it, until just before New Year! We put the fire engine together first but couldn’t fit it in the station so we parked it outside while the cat and dog were rescued from a burning fire engine and a tree! Mr B’s friend was very impressed with the set and especially with all the fire fighters – great to see a diverse range of characters, especially as so many of these sets still come with only white male options. This is a great set as there is so much to do. I loved that we built the set together and then he was able to do the activity book with little supervision. 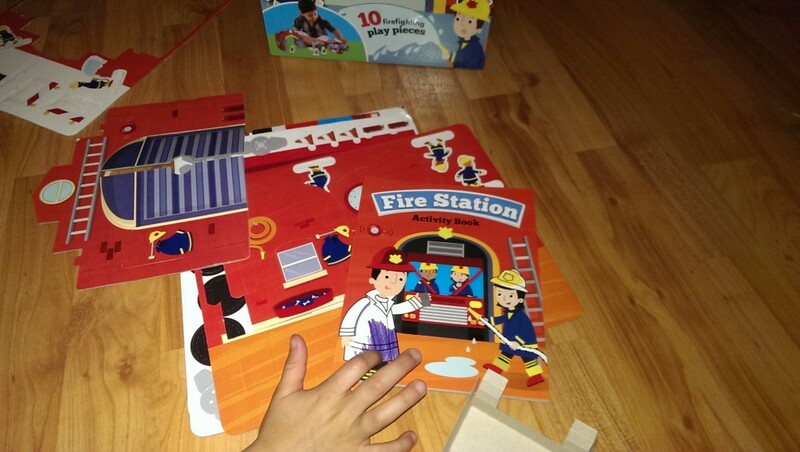 I’m sure the fire engine will be played with until it falls apart too – lots of creative play with this one. I highly recommend it and in fact am already thinking of it as a birthday present for a certain fireman-mad little boy we know! 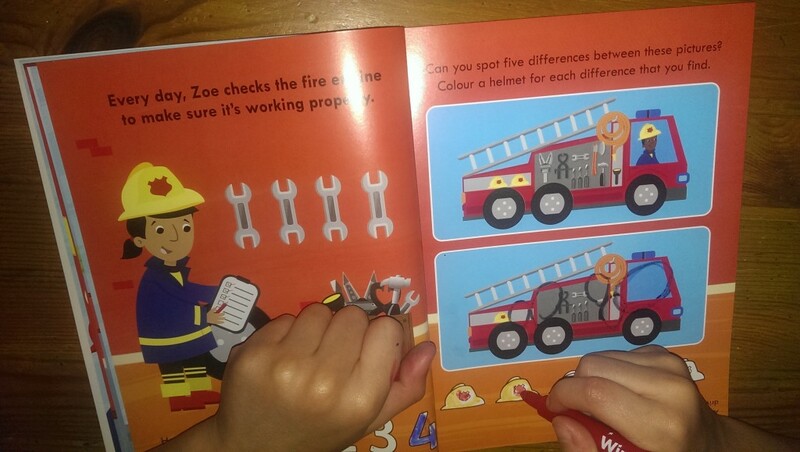 If you know any budding firemen or women, you can get yours from The Book Depository for £7.58. Of course it’s also available from Amazon (at the same price). *Disclosure: Mushroom and I are Parragon Book Buddies and receive a new book to read and review each month. All views are our own. Read my full PR and disclosure policy here. 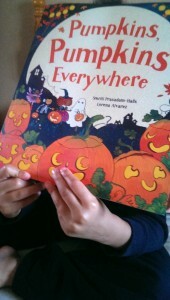 Actually they’re not, which is a bit of a pain as Mushroom really wants us to carve a pumpkin this year, thanks to our latest gift from Parragon Books. It’s a simple rhyming book, with lovely illustrations of children (with all those pumpkins!) 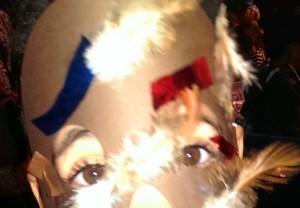 getting ready for a Halloween parade. Mushroom and I don’t really ‘do’ halloween at home, other than giving sweets to any trick or treaters who turn up (not many!) and a one-off themed party he had at nursery once but he does like the idea of pumpkin lanterns, having spotted a few themed plastic torches in toy shops lately. He actually wasn’t that interested in the story this time, preferring to look at the illustrations and come up with his own! So when said “Pumpkin happy,” he responded with “Yes, because he has all the sweeties!” and “Pumpkin fly” was met with “That boy might drop him!” He asked if the pumpkins were alive and I explained that they were lanterns that people make by carving pumpkins…. 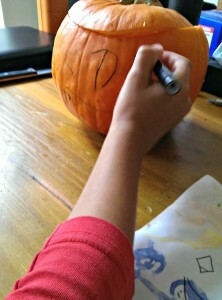 And pointed out the pumpkins carved into different shapes, like a spider and a cat, at the end of the book. So now of course he wants us to carve one this halloween! Once Mushroom has an art project idea in mind he doesn’t forget it so I had better keep my eyes open for at least one pumpkin, and hope he doesn’t expect me to carve spiderman into it! If we manage to find a pumpkin and carve something that doesn’t look too terrible, I’ll come back here next month and post it below. See the final results here. This summer we received two treats from Parragon Books, both of which were fantastic for surviving the rainy days (and waiting in restaurants, among other things! 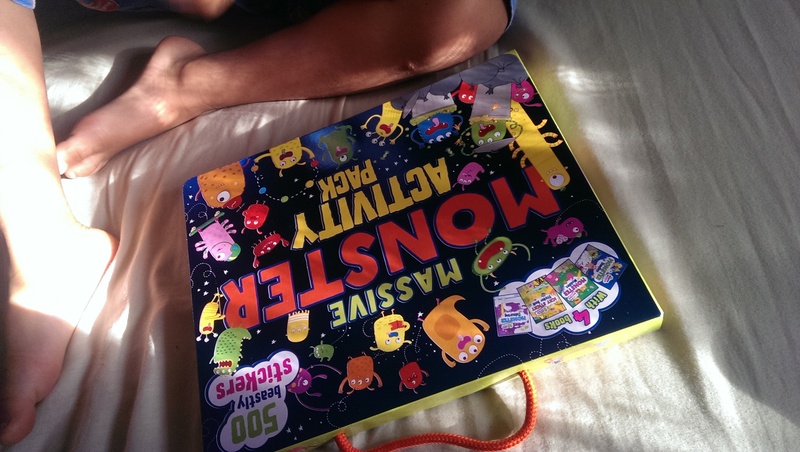 ): The Massive Monster Activity Pack and Spot A Lot: Animals Jigsaw. The Monster Activity Pack came in July and we are still making the most of it! 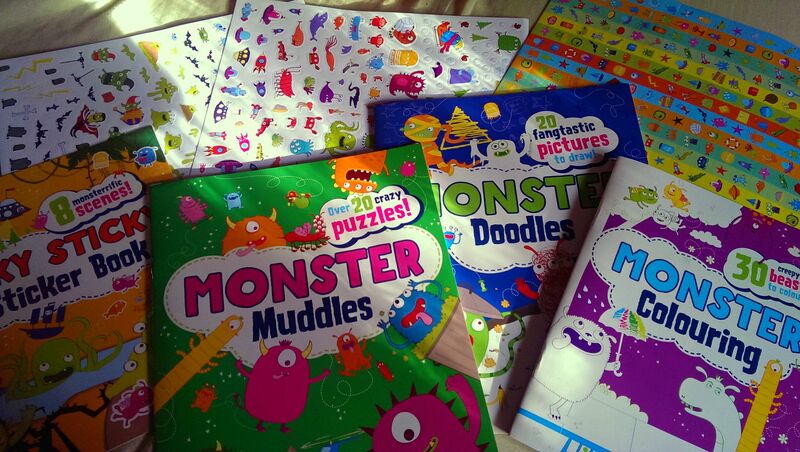 It really is a monster of a pack, made up of four books: doodles, muddles (that’s monster-speak for puzzles! ), a colouring book, and – Mushroom’s favourite by far – a sticker book with 500 STICKERS! 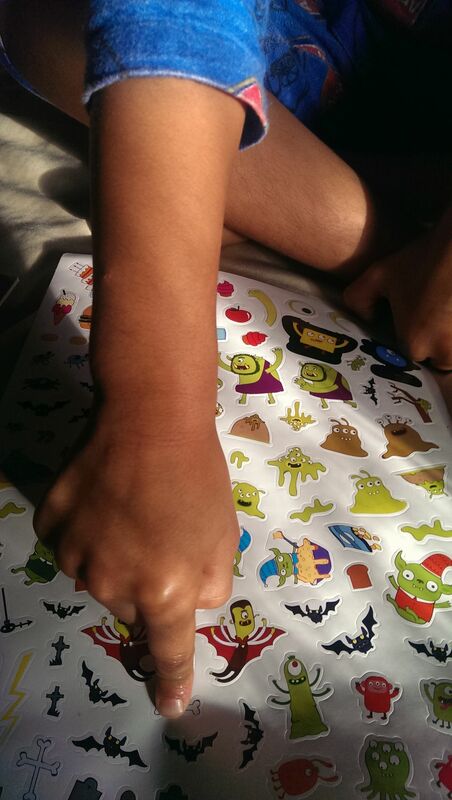 The sticker book came on a few restaurant trips with us during the summer and diverted at least two potential meltdowns. Both of the Monster Pack and the Spot A Lot book and jigsaw set come in lovely briefcase-style packaging, perfect for little hands to cart around when on trips although as the title of this post suggests, we made the most of these during some of the rainy days we had this summer. We are colouring it a little at a time and still have much of the picture to complete but we’re not in a hurry. And we still have all those monsters to colour in too! Both of these books would make great presents (and I highly recommend the Monster Pack as a travel companion), especially if you add a pack of colouring pencils or crayons – you could even pop them inside, so the happy recipient is good to get started right away! Disclosure: Mushroom and I are Parragon Book Buddies and receive a new book to read and review each month. All views are our own. Read my full PR and disclosure policy here. 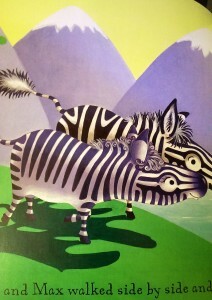 Spot A Lot: Animals Jigsaw is available at Smyths Toys. When last month’s book from Parragon Books dropped through the door, I was excited to show Mushroom, knowing how much he loves to read Spot A Lot Animal Escape, which we received last October. When I opened the envelope to reveal the front cover to him, he immediately said, “It’s like the zoo book Mummy! Do I need to find a turtle..?” I suggested he look more closely at the cover… His face lit up. “It’s diggers [a crane, actually…]! And trucks! And cars! And aeroplanes…!” Yes, Mushroom. There was something to look for on every page, just like the previous book and just as with that one, Mushroom loved being the first to find the little dog! 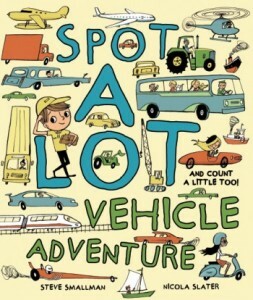 I love these books as a great way to really engage Mushroom in the detail of the illustrations as well as for the gentle storylines … But as I said with Spot A Lot, it’s a little too exciting for bedtime for us! So they make for a great way to spend downtime on days when he could do with a nap (but won’t). Do you ever spend time looking at books just for the illustrations..? Or do you always read the story..? This month Mushroom and I have been enjoying Growl with the Animals, an interactive book of noisy creatures for little learners. …and he thought the hyena’s ‘laugh’ was funny, but not actually that much like a laugh! We both learned new things (I didn’t know a whale’s tail is called a ‘fluke’, did you?). Mushroom loves to be ‘tested’ on each animal. He remembers that dolphins and cows have something in common but not always what it is (both their babies are called calves) and he says that he can hold his breath underwater for as long as a hippo (five minutes. Mushroom can hold his breath for quite some time…. but not that long!). 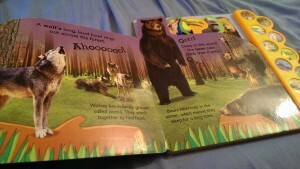 What did we learn about wolves and bears…? You’ll have to get the book to find out! 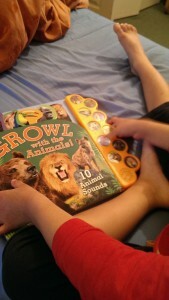 We enjoy reading this book together, and Mushroom can also while away quite a long time ‘reading’ it by himself! It’s a lovely book to have if younger children come to play as it’s suitable from an early age and it would make a great gift for button loving toddlers. You can buy Growl with the animals from Amazon. Disclosure: Mushroom and I are Parragon Books Book Buddies and receive a new book to read and review each month. All views are our own. Read my full PR and disclosure policy here. Mushroom’s favourite way to spend time indoors is to create. Building with bricks, sculpting with play dough, sticking, painting, drawing and colouring are high on the list of his favourite activities. We’ve loved all of the books we’ve received from Parragon so far and this is no exception. For me, it was win-win as finding something we can do together, that I also enjoy, is always a bonus. 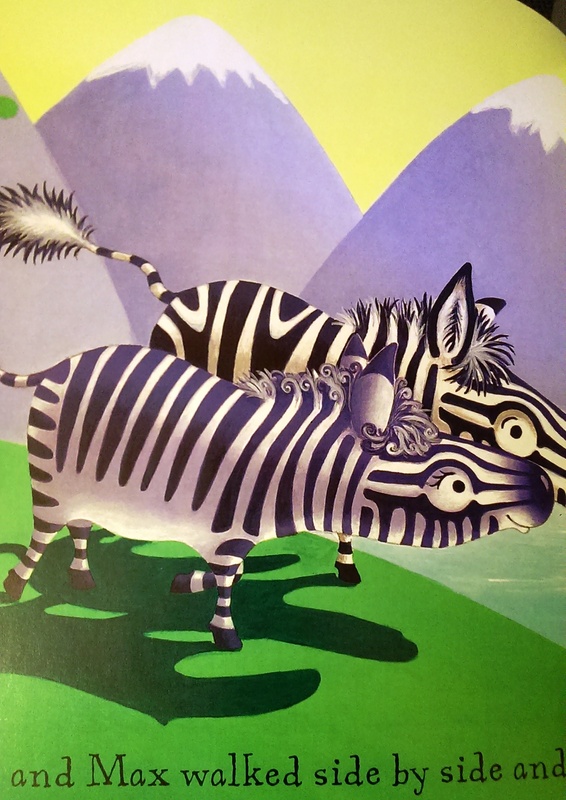 Each page of this book is partially illustrated with images and patterns to get the imagination going. The idea is that it inspires the artist in your child (and you, if you’re anything like me!) 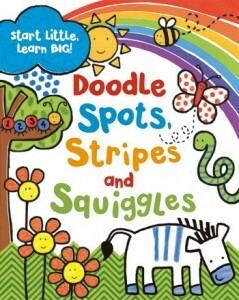 to get creative and continue the doodles to create their own masterpiece. Every spider needs a web! The house needs bricks… Mushroom thought it just needed more colour. Drawing dots or joining them..? Creating his own patterns from the prompts! We both find creating very therapeutic, and when either one of us is on the verge of a tantrum (yes, us parents have them too!) it’s a great diversion and a way to bring us back to the present by doing something together that makes us happy. Hosted by Big Fish Little Fish and held at venues across London, these family raves are basically mini festivals aimed at families. The aim is for both parents and kids to enjoy the event, which we all did! The theme of the rave we went to was the Enchanted forest and there were related crafts for the children to do, as well as face painting, tattoos (temporary of course!) and a professional DJ playing club classics throughout. When we first arrived, Mushroom and I were a little overwhelmed so as his friend Peanut rushed straight in and started to dance straight away, he asked me to hold him while we both took it all in! The lights, club visuals and lighting, everyone waving glowsticks and some of the kids wearing tails. Once Mushroom had warmed up by sitting down to a craft activity, he had a little dance and then said that he needed to ‘get out of here.’ Luckily, there was a chill out room (yes really)! Aimed at babies and perfect for those who are a bit sensitive and need somewhere quieter to go, Mushroom enjoyed playing in the tents dotted around the room and listening to chill out music. It was in this room that we noticed that almost all of the children were wearing tails and realised they were there to be borrowed! Mushroom loves dressing up and his face lit up when he managed to find a tail each for him and Peanut to wear! After some downtime and a snack, I asked Mushroom if he wanted to dance and he said that could do ‘the tail feather dance’, which he did. It was perfect timing as it was near the end of the rave and after he and Peanut danced under a giant ‘parachute’, tikker tape rained down on everyone before the bubble machine started and the party wound down. On the way out we received very welcome complimentary smoothies and snacks courtesy of Happy Monkey and Bear Snacks. We had such a good time that we’re already planning to book our tickets for the October date! Disclosure: We paid for our tickets to this event, we just enjoyed it so much we wanted to share! Find out more about Big Fish Little Fish events over on their website. We don’t make a big deal about Valentine’s Day in our house. Last year we just made heart shaped sandwiches for Mr B and a heart shaped cake for us all to enjoy and this year it was just heart shaped toast (that went so quickly I forgot to take photos!). Mushroom helped me make the toast and as we were doing so, he asked why. I told him that some people celebrate Valentine’s Day in a big way and some just think of it as a reminder to tell those we love… That we love them. 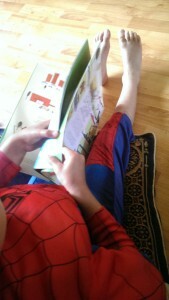 That evening seemed like an appropriate time to read him our latest Parragon Book Buddies book! 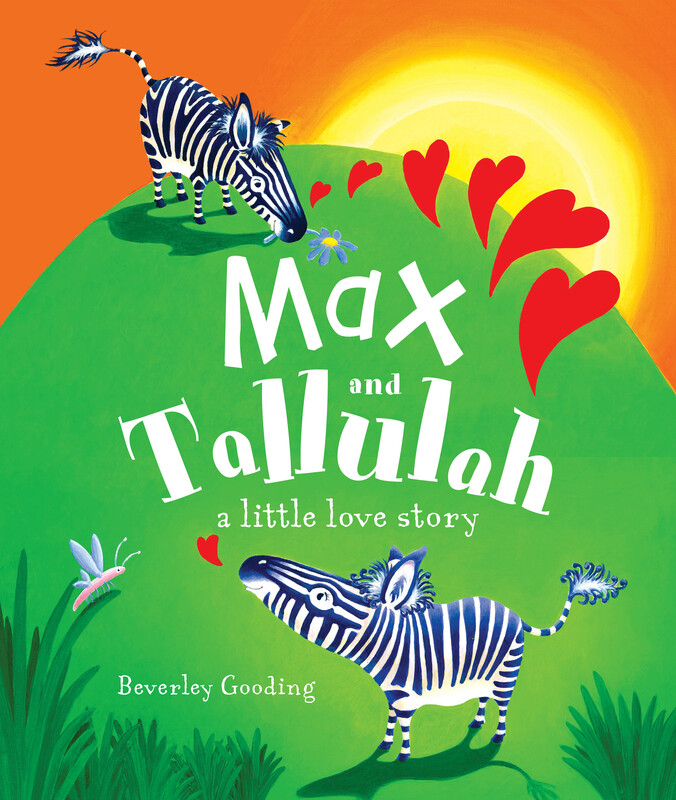 Max and Tallulah is a lovely little love story about a shy zebra, Max, who wants to tell his friend how much he loves her. He doesn’t have the words so he tries all sorts of ways to get her attention but each time, something goes wrong. The fruit he picks for her floats away, his moon dance goes completely unnoticed and his spectacular hat just frightens her. Finally, he decides just to be himself. Whether you read it as a romantic love story or just as a way of introducing the subject of being yourself in friendships, it’s a lovely little tale. Mushroom enjoyed the story and said that Max was ‘silly’ and Tallulah ‘probably laughed’ when he finally told her all about the things he’d tried to get her attention. He said he should have just ‘asked her to play’ from the start. I love the way children approach relationships, and hope that Mushroom always remembers this approach and continues to believe that simply finding something to do together (whether that be ‘play,’ or something else!) will work into adulthood. 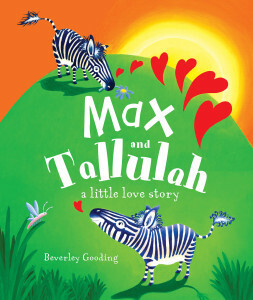 You can find out more about Max and Tallulah author and illustrator Beverley Gooding and her creative process over on Parragon Books’ website. This month’s Parragon Book review comes with a hefty side helping of honesty about gender roles and whether I live up to my own ideals..! So, after the craziness that is Christmas and the beautiful treasury of Christmas stories and songs that Mushroom and I have been dipping in and out of since we received it, I sort of forgot about January’s book until the email dropped in my inbox. My first thought (and I hate to say it!) was ‘I wonder if that’s a bit ‘girly’ for Mushroom?’ The book was part of a new series of interactive books released last month, starring Glitterbelle, a modern day princess. Glitterbelle is described as smart, funny and enthusiastic and she loves riding her scooter and climbing trees. Although she has plenty of sparkly ‘princess’ dresses, she prefers her leggings and glittery trainers. Each page in the books is a photograph of a stunningly designed miniature 3D set created by Harriet Muncaster with which the reader can interact, adding his or her own creative input. When I read the description, I challenged myself. What exactly did I mean by ‘girly’? And where did that come from..? Whose voice was in my head (because it didn’t feel like mine!)..? Mushroom likes scooters and trees and sparkly things and loves creative activities so why wouldn’t he identify with Glitterbelle and enjoy the books? 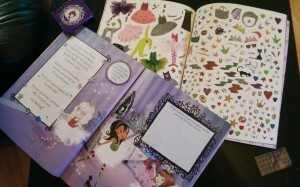 We received two books from the range (there are four in the series); Dazzling Dress Up and Doodle, Dazzle, Create! Mushroom was drawn to the Doodle, Dazzle, Create! book first as he liked the sparkly tin notepad but once he had opened that, he lost interest a bit. We have looked through it a couple of times and he has coloured in some of the pictures but he hasn’t really engaged with it. Not to say that he won’t come back to it though, as we have now got through almost all the stickers in the Dazzling Dress Up book, which was by far his favourite! Mushroom loves stickers and dressing up. He likes to try on clothes before we buy them and he actually enjoys clothes shopping – both for himself and for me. He likes trying things on where possible and has very strong opinions on my choices! 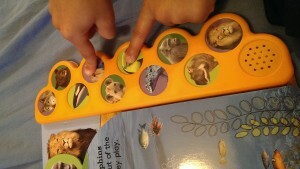 So he has really enjoyed interacting with this book. He’s not so interested in the story – he keeps saying he will ‘read it later’ and makes up his own narrative about what the girls are doing as he dresses and accessorises them. This is one of his favourite activities to do before bedtime, I think he finds it calming. I thought the sets were stunning, so much detail has gone into each page that I almost didn’t want to then mess with them! 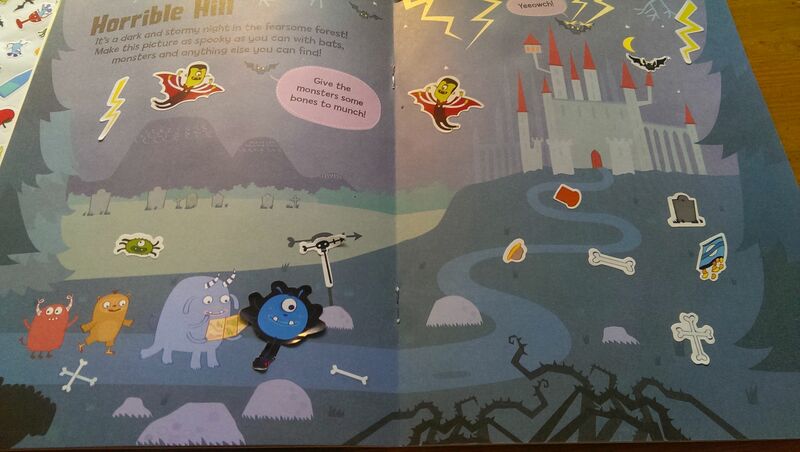 But the books were not for me and Mushroom loved dressing the girls up and creating his own stories. The books are aimed at children up to the age of six, and I do think that slightly older children might get a bit more out of them but if your child is the creative type and especially if they are in to princesses, then they might enjoy getting to know Glitterbelle. You can learn more about her on the Glitterbelle website. My initial reaction to this book has made me really pay attention to when I might be encouraging gender stereotypes. While I’m mindful to challenge Mushroom when he says that things ‘are for girls/boys’, which he generally explains with ‘[insert random nursery friend’s name] says so,’ suggesting that the messaging is not coming from me, there are clearly some things that to me feel much more marketed at girls and I would perhaps shy away from buying if he hasn’t asked specifically for. Funnily enough, as I was thinking this I read Nina’s recent post on whether we are raising our kids to confirm to gender stereotypes and it certainly got me thinking again. Maybe I’m actually overthinking it sometimes… What are your thoughts?